The Chechen President sat in his office and was looking through next year’s draft budget, which had just been placed on his desk. "It’s a tidy sum, as long as Moscow doesn’t say no," he thought, glancing at the totals at the end of the document. A telephone rang. It was the government phone. Kadyrov picked up the receiver. “Oh yes?” Kadyrov said, pricking up his ears. An evasive beginning of this kind might not bode well. “Now you know that Russia is a democratic country, don’t you?” Surkov asked, getting down to business in a slightly insinuating way. “Of course,” the Chechen president replied with a sigh of relief. The conversation was evidently to be about the upcoming municipal elections in the republic. “And in a democracy the leaders do as the people want them to ...” the deputy head of the Russian presidential administration went on. “That’s a lot of nonsense,” Kadyrov said, getting worked up. “Is this a joke?” Kadyrov said, uncomprehendingly. “But what about... the budget?” Kadyrov pointed at his desk where the draft budget lay, as if Surkov could see his gesture on the phone. But the Kremlin official understood. “And what do I do now?” Kadyrov was unable to collect his thoughts and bring this – in his view – absurd conversation to a conclusion. .
“Why? 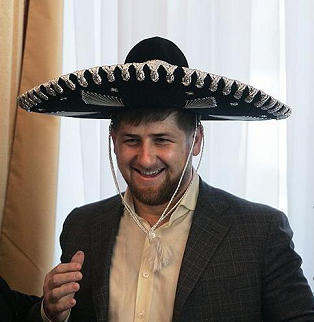 “ Kadyrov asked in genuine surprise. “Yes,” Surkov agreed. “Russia doesn’t recognize the Caucasus Emirate. The people don’t want a man like that. Well then, who are we to recognize? Zakayev, perhaps?